So on Google+ there’s this little bracket at the side that’s a shortlist of people Google thinks you might want to add to your circles. Sometimes it’s, ‘oh hey, you might find these subjects interesting’, but mostly it seems to be, ‘people in your circles follow these people, wouldn’t you like to too?’*. It’s interesting, because mostly that means the suggestions are for what I’d refer to as second-tier friends — people you’re vaguely acquainted with or see at parties because your social circles intersect but that you don’t really know. 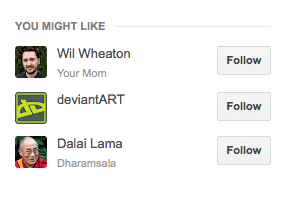 My second-tier friends… Wil Wheaton, DeviantART and the Dalai Lama. Apparently. He has hair? Well now, that’s even more impressive at his age. We should definitely bond.